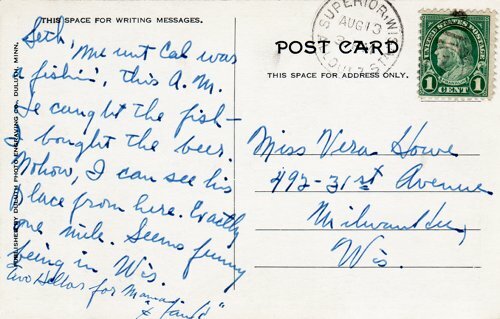 a fishin', this A. M.
The message on this postcard presents multiple obscurities, of which I'll tackle a few. Date sent: In those days the U.S. Post Office in Superior in extreme northern Wisconsin used a cancel which included the time of day, but not the year. 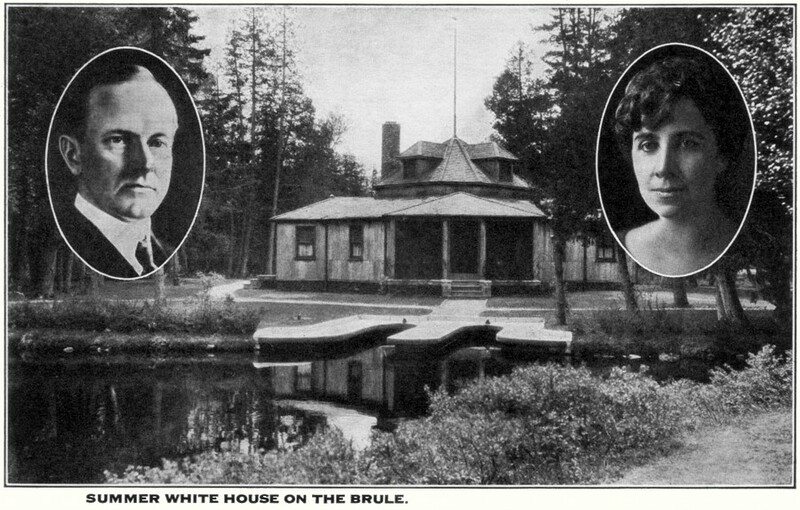 Calvin Coolidge accepted the loan of a rural house on the nearby Brule River for the Summer season of 1928, his final year as President of the United States. I don't think he visited it again after 1928. 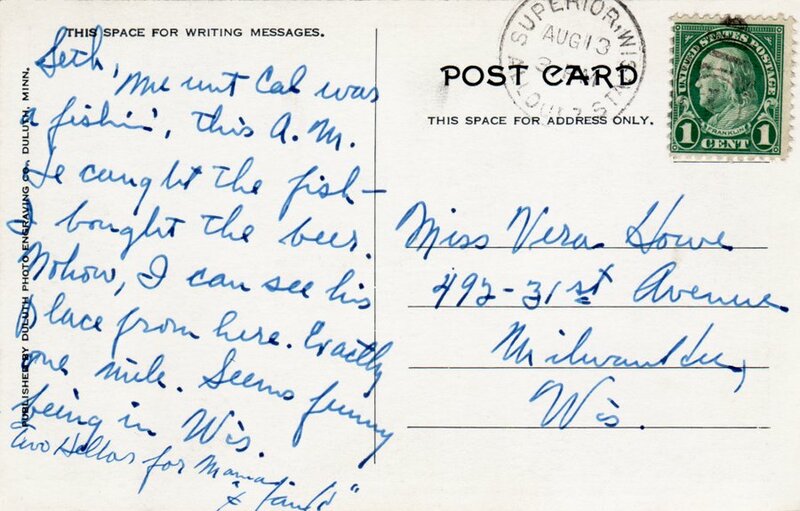 — Vera Howe's family had moved to another address in Milwaukee before August 1936. So the outer parameters for the year are 1928 through 1935, more likely the earlier years. "Seth" puzzled me exceedingly. There's no Seth in the recipient's immediate family. A private joke understood by Vera Howe? A reference to a personage in Antiquity? Eventually it occurred to me that since the fraternal-jocular tone of the message must be the key, this likely is a pretend message sent to someone named Seth who was a relative or associate of Coolidge, since the latter's vacation spot is the subject of the postcard photo. Research turned up "Seth Parker", the name of a contemporary and famously New-England-folksy radio show run by Phillips H. Lord (also creator of Gang Busters and many other shows). New Englander Coolidge's presidential inauguration in 1925 was the first such to be broadcast via radio; but he was not renowned for his humor. "Cal" then must refer not to another unknown real acquaintance of Vera Howe, but to Calvin Coolidge himself. Which explains why the sender oddly mentions that he "can see his place from here", a mile away. If really we are fishing with a friend, it wouldn't be worth mentioning that we can see his house. The handwriting and perhaps the style of the joke presumably were recognizable by the recipient. I don't know the real sender but someday may figure it out.